For some time I had been looking for a way to get my photographs off the hard drive and out into the world. When my daughter was diagnosed with Type 1 Diabetes at ten years old, I could not have imagined that we would end up here, with a healthy, confident young woman eager to improve the lives of people in difficult circumstances, and also the perfect means to solve my photos’ confinement woes. It seems people who are unwilling to wear traditional medical alert jewelry because it is too ‘medical’, are attracted to the cDogs. 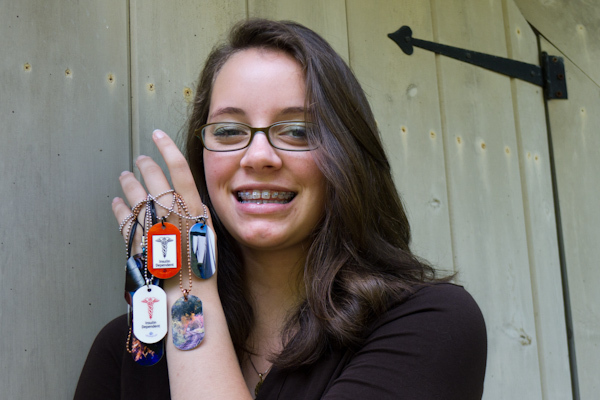 Playful or beautiful, hobby or logo, show your personal style on your cDog dog tag! From there, we began making keychains without the medical alert. Then, custom ID tags for our musician friends, custom keychains and pendants for memorials and for fun. It was a short hop to other types of wearable art, including the cuff bracelets that also became Doodle Cuffs! Fun and useful, too! The ideas kept coming and things started getting a little crazy. Major life changes wreaked havoc for a while, too. Ready for a new beginning, Sally met with a great team of mentors from her local SCORE chapter. They asked a lot of questions, pawed over a bunch of product, shot ideas back and forth, and then asked The Question: What do you need from us, Sally? My answer: Rein me in. Help me focus on the ideas that will move my business forward. That’s exactly what they did. Our next business model took it on the road while we travelled to events and set up for custom items made on the spot. Custom cellphone & tablet cases were the thing… very exciting! Indoor and dry day events were great, but our raw materials are sensitive to humidity and sometimes the great outdoors was just damp. But we learned a lot and met some great customers and event coordinators along the way! More life changes brought a full year haitus from the business. Sally was out shooting great pics though, and a new vision began to take shape for cShoresal. We are very excited about the prospects! Our artwork or yours, applied with care to top of the line materials for a final product you will be delighted to showcase on your indoor or outdoor walls, or in your retail gallery or gifts shop space. Also, an amazing way to recreate your old family photos. Your ancestors never looked so good! We can’t wait to show you what we can do for your walls, for your family photos, or for your shop!